This three part tasting dish I put together to enjoy the bountiful harvest of tomatoes available near the end of summer is comprised of a tomato sorbet, a basil panna cotta, and a simple version of a tomato tart. Utilizing the freshest tomatoes and experimenting with heirloom varieties enhances the complex flavors this dish can produce. Particularly for the cherry tomatoes, you will want to find a myriad of colors, shapes, and sizes to provide visual contrast and texture. Now would also be a good time to invest in some quality rock salt to garnish with. The salt will enhance the flavor of the sorbet and provide a satisfying crunch. 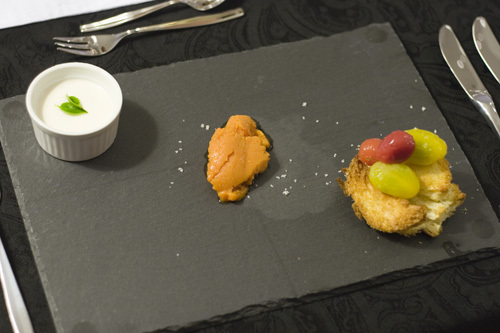 If you’re feeling especially ambitious, check out the dinner party this dish was featured in for more ideas. For the cherry tart you can either purchase a pre made sweet bread such as brioche or challah or use the brioche recipe here. Just ensure you time the bread preparation so that it has time to rise, bake, and cool. Remove the skins and discard. Cut the tomatoes in quarters and squeeze out all the seeds and juice. Rough chop the remaining tomato flesh. 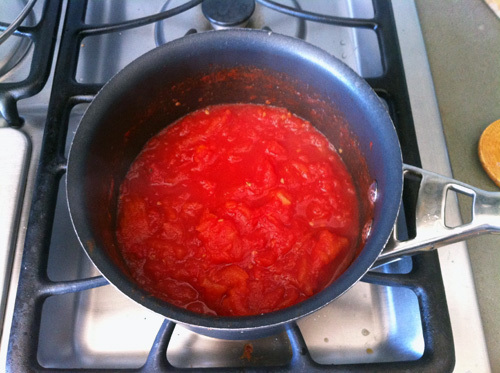 Place the chopped tomatoes in a high sided non stick pot and bring to a simmer. Cook at a simmer for 45 minutes to concentrate the flavors. There should be some liquid remaining. 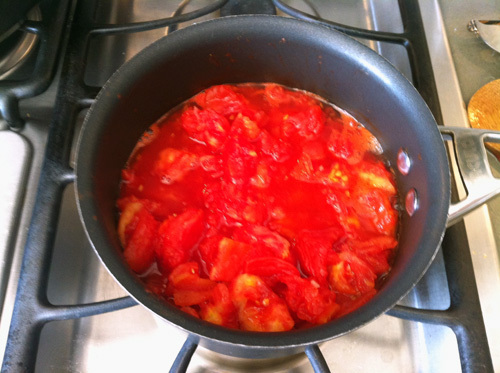 Place the tomatoes, red wine vinegar, tarragon, and cayenne in a blender and puree until smooth. Add half the sugar and water mixture and taste for sweetness. 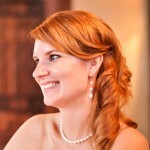 Depending on your tomatoes and how much they reduces, you may need more or less sweetener. Add the salt and again check the taste and adjust if necessary. Cool the mixture over an ice bath and then freeze in an ice cream maker. Store in the freezer until 30 min before ready to use. 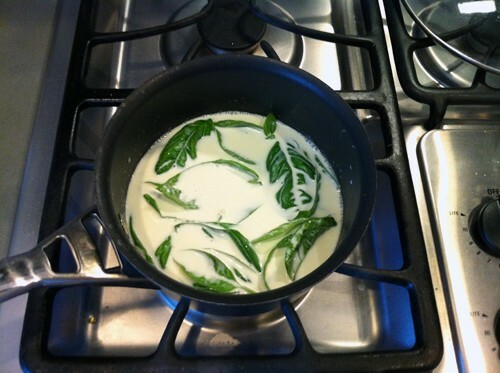 Combine the cream, sugar, and basil leaves in a small saucepan and stir to dissolve the sugar. While the basil mixture is steeping, dissolve the gelatin in the water and reserve until needed. After the steeping period, strain out the basil and discard. Stir in the gelatin mixture until fully dissolved. 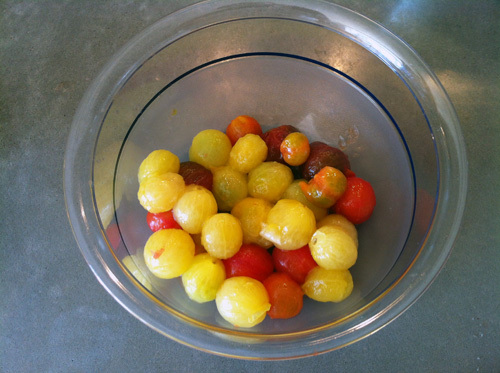 Cut a small X into the top of each cherry tomato where the stem was attached. 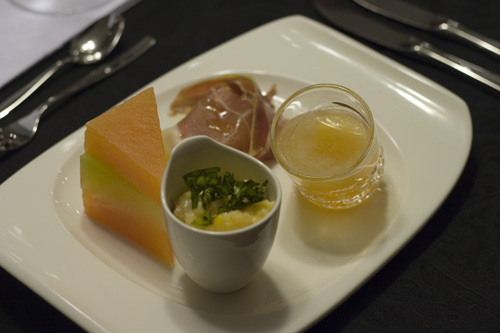 Finish the dish with the rock salt, serve, and enjoy!